Words can’t really describe what I was thinking before I arrived at Medinah Country Club. Earlier in the year I was speaking at an event in Chicago, and met Brian. We had quite a bit in common between the type of work we do and our love of golf. Turns out he was a member and said to let him know next time I was back in the area. And just like that I’d be spending a day on one of the most exclusive and historic courses in the country. It was established in the early 20s by the Shriners, and like many of the Chicago area courses, can be a pretty tough ticket to get on. A few days prior to playing it had been pouring in the area (see photos of Erin Hills). So I was a little nervous we might get rained out, or almost just as bad, play and have a miserable time. When I woke up on that Tuesday morning any fears of that were quickly laid to rest. We couldn’t have asked for a more beautiful October day. I mean seriously, 65 degrees and clear blue skies. Yep, this is what it’s all about. I made the almost hour drive from where I was staying near Wicker Park and the closer I got the more nervous I was. Aside from my round at The Club at Black Rock, up to this point I hadn’t played at a world class private course before. 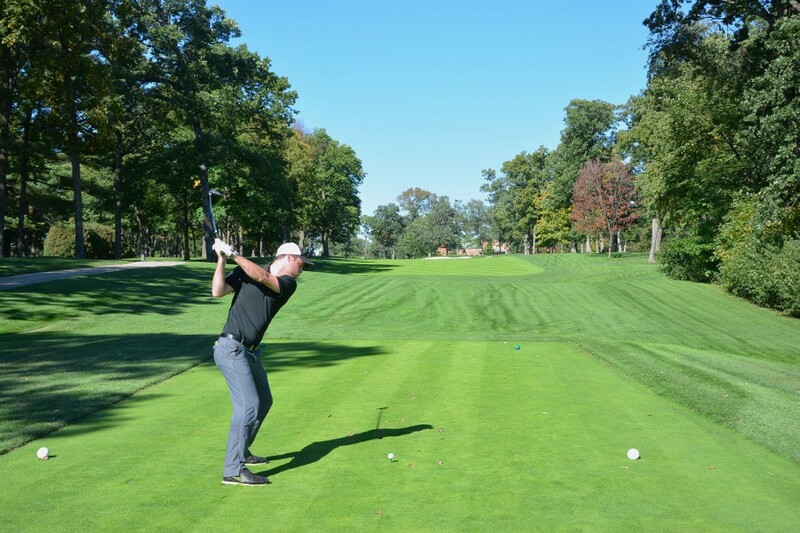 And let’s be honest, there are some pretty big differences between a place like Medinah and Black Rock. Not better or worse, mind you, just very different. Making the drive into the club was about as beautiful as it gets. There’s a sense of grandeur that I’d never experienced at a golf course before, and from the moment I got out of the car the service was first rate. The valets, the caddies, the locker attendents – everyone was extremely friendly and looking to make sure we had a good time. Along with Brian I’d be playing with Scott, who I met through Brian my last time in Chicago and Mike who is also in the marketing world. Mike and I arrived first and we introduced each other and headed out to the range to hit some balls. Scott and Brian showed up shortly after, and pretty much the only thing on my mind at this point is don’t make a fool of yourself. Note: While I didn’t completely make a fool of myself, I posted one of the worst scores ‘d had in a couple years. For the great pars I had, I experienced even more triples on a course that definitely lives up to being a very difficult, championship course. 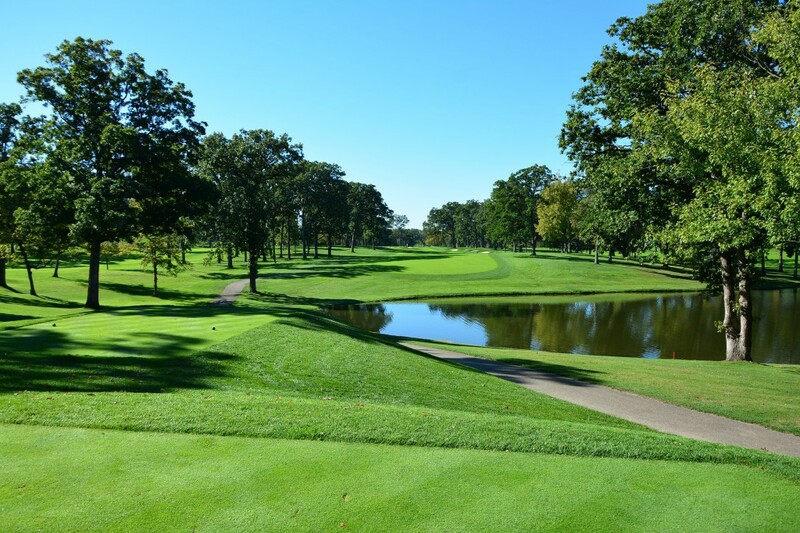 The first hole on Course #3 at Medinah is actually a relatively benign par 4 that leads you out towards Lake Kadijah. While I didn’t exactly hit many good golf shots on this hole, there’s always a deep excitement anytime you’re playing a course with such history. I’d heard both amazing and terrible reviews of the par 3s at Medinah. Critics would say they weren’t varied enough. However I found the par 3s at Medinah to easily be some of the best I’d ever played. The second is the first par 3 on the course, and doesn’t waste any time ramping up the difficulty. It only measured 151 from our white tees, but it’s all carry. Short? In the water. Left? In the water. Long? Sand. Right? Sand. I hit a good shot that was just off the green to the right. A nice up and down that made up for my double on the first hole. A mid-length par 4 with a slight dogleg left. It’s easy to be sidetracked while standing on the tee due to the beautiful pond just to your right. A long, straight away par 4 that’s more difficult than it looks. If you find yourself in the trees to either side of the fairway you’ll have a difficult shot at par, but there’s a lot more elevation change from the middle of the fairway up to the green than it looks from the tee. Take an extra club to get it up there, because if you come up short, it’s a long way down. Looking out at hole 5, this is exactly what I expected Medinah to be. Narrow fairways, lots of difficult bunkers, and beautiful parkland style trees. An absolutely gorgeous (and difficult) golf hole. At 488 yards it’s not an incredibly long par 5, so play smart and even consider going 3 wood off the tee due to the narrow fairway. Now this is a golf hole. When a 432 yard par 4 is only the 7th handicap hole on the course, you know you’re playing a hard course. Dogleg right with bunkers in all the wrong places. Avoid the lefthand side of the fairway, and make sure you hit the green off the approach. I landed on the beach and promptly chipped out and into another bunker across the green. You don’t get a break moving into 7 which is one of the toughest holes on the course. A very long dogleg right, you’ll need to hit two solid shots to give yourself a good approach. Be sure to take a look at “Bebb’s Oak”. Any member you’re playing with should be able to point it out. It’s the 3rd oldest tree on the property and was germinated in 1664. The only par 3 that isn’t over water – but that doesn’t mean it’s any easier. Ok, maybe it’s a little easier, but not much. Also make sure to grab a snack at the halfway house. #3 is designed with the house smack in the middle of the course, giving you opportunities to grab food or drinks after 8, 11, and 14. I highly recommend the cheese and crackers. The only par 3 without water. A sharp dogleg left, that has plenty of risk reward opportunity. A 3 wood might be the smart play, but if you can knock a driver down the left side you’ll have a much shorter approach. Just be aware of the trees. A long par 5 on the outer perimeter of the club. There’s a slight chance I may have hooked my drive out onto the street, but we don’t need to tell anyone about that. This will most likely be a 3 shot hole however, so don’t feel like you need to break your back off the tee. 11 is a very sharp dogleg left. If you’re feeling gutsy, you can do as Brian did and try and knock it over all the trees. He was rewarded with less than 100 yards on the approach. Most people will just be glad to get it past the dogleg giving a clear view of the green. Brave enough to cut the corner? One of the most unique and difficult holes on the course. 12 is a long par 4, with an elevated green and the most severely sloped fairway on the course. Oh, and it slopes into a lake. During the Ryder cup they said it was cut so short that anything missing the green was pretty much destined to get wet. One of the more memorable holes on the course. This is one of those holes where you need to go hit from the back tees just to do it. I pulled my driver and made the hike up to the top of the hill just so I could say I did it. Our host told us that during the tournament last year Michael Jordan and George Bush were sitting right behind this tee all afternoon. Apparently our former President loves golf, because I heard a similar story during my round at Oakland Hills about him showing up at the Ryder Cup in 2008. Beautiful and fun par 3. Mid Length par 5 with a drive over water. Make sure you use enough club on the approach otherwise you’re pretty much guaranteed a spot on the beach. One of the more newly remodeled holes on the course, and a lot of fun. A short par 4 with a lake down the entire left hand side. Smart play is a hybrid or iron to the middle of the fairway, but there’s no denying there’s a certain appeal to taking a big rip with a driver. Similar to hole 11 in the sense that it’s a sharp dogleg left, with the potential to cut it over some trees. It actually feels like a much more difficult between increased length and an elevated green, but by handicap it plays easier. The final par 3 also plays over water, and has evolved a lot through the years. In the mid-nineties, it was positioned up above the water on the hills. However after Tiger Woods won his first PGA Championship in 1999 they moved it down to it’s present spot along the water. From the tips this hole plays nearly 200 yards of nothing but carry. The back bunker is deep, and if you’re short, well you know what that means. The 17th green and 18th tee. The closing hole is a slight dog leg left and has what might be the largest flag pole I’ve ever seen towering over the green. The fairway bunkers are in play, so be smart off the tee. There’s a bailout area to the right of the green, but if you’re going at the flag watch out for deep bunkers in front of the green. My 99 was one of the worst scores of the trip, but despite the high score, the round was easily one of my favorite from the trip. This was one of the only rounds I played with people in my industry that I really could learn a lot from. It gave me a glimpse of the life I hope to be living in a few years, and I can’t thank Brian enough for the opportunity to play the course. Hopefully I can make it back sometime in the next few years to play the new Tom Doak remodel of Course #1 which sounds like it’s going to be impressive. Great review. #3 at Medinah is an outstanding test. The 17th has always played over the water though, that was never changed. It played officially at 206 yards over the water in 1999 at the PGA Championship.